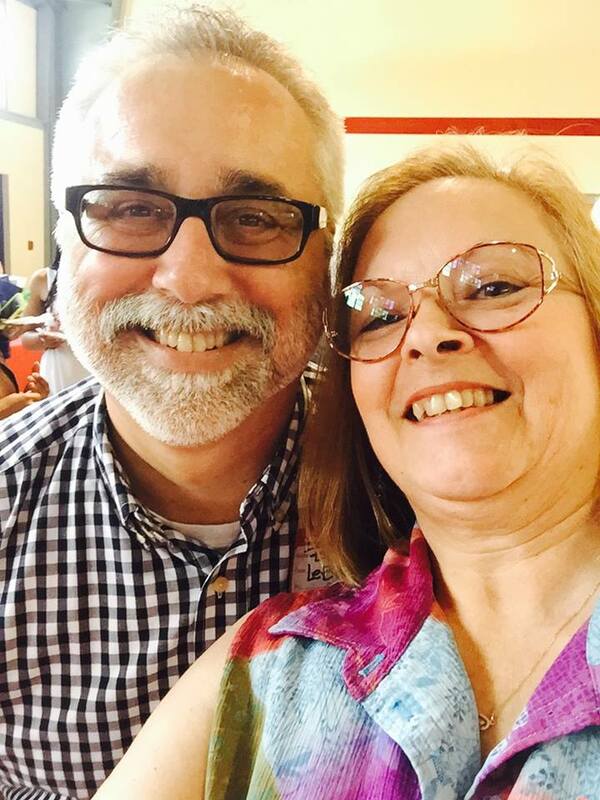 This past weekend, I attended a reunion of sorts. 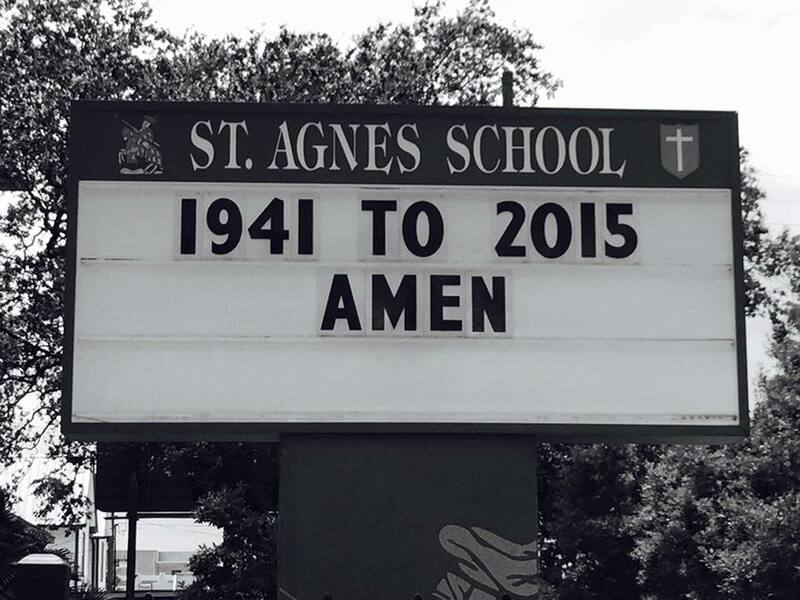 We celebrated 75 years of educational achievements St. Agnes Parochial School accomplished. 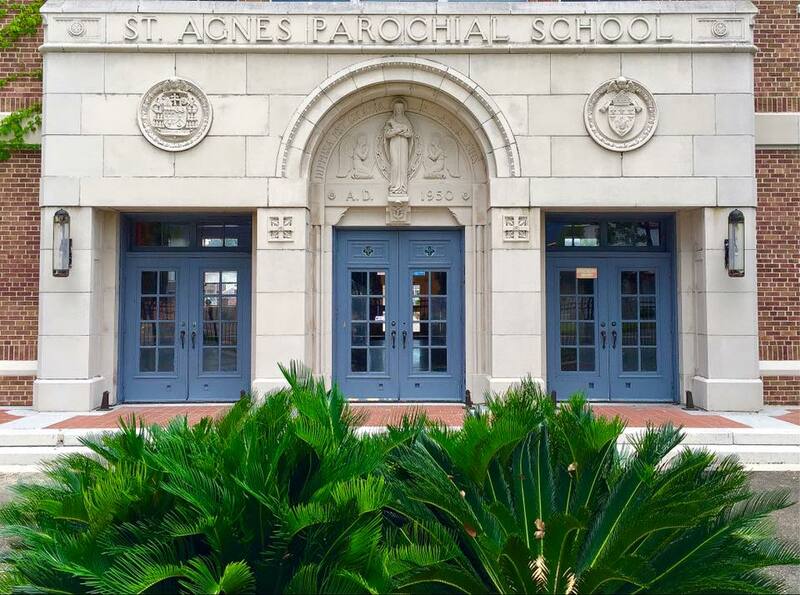 Thousands of boys and girls passed through the doors of St.Agnes, boys in their tan khaki shirts and pants, girls in white blouses and navy blue skirts. (the uniform code was changed later on, but that was long after I left) Unfortunately, due to low enrollment over the past several years, the decision was made to close the school. Like anything else that happens in New Orleans, whether good, bad, happy or sad . . . IT WAS PARTY TIME! Thus, The Final Bell Has Rung Celebration was created. I’ll get to the celebration in just a bit. I must admit, when I first read about the closing of the school, it saddened me. So many memories came rushing into my head; teachers, classmates, activities, school plays, field trips, etc. I had my own personal movie playing in my head. I also visualized the layout of the school. 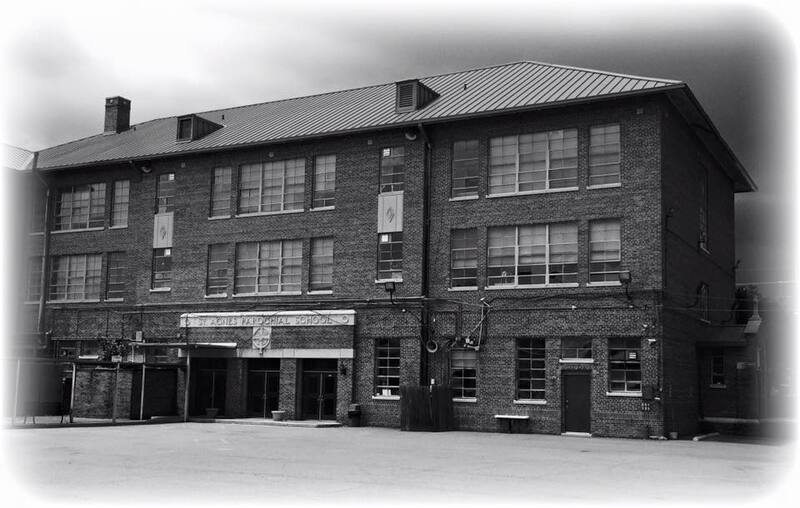 (Spending 8 years in the same building, you get to know your way around) I could see the cafeteria and remember the smells of the lunches Mrs. Jeansonne prepared for us each day. I think we were all too young to appreciate how good her food was. How I would love to taste her chicken and rice again. It amazed me how much I remembered and how clearly the memories were. Most of the time, I have trouble recalling events from the day before or even 5 minutes ago, however, Alzheimer’s, if there is such a good thing about this damned disease, still allows me to recall memories of long ago. One of my fondest memories was due to the huge enrollment in the 60’s (we were the Baby Boom Generation). The school ran out of classrooms. So, my 1st Grade class (1966) was in an old house behind the school. The next year the portable buildings were completed and they housed Grades 1-4. The main building was for the upper grades. Moving into the main building for the 5th grade took a little getting used to. The hallways of the second and third floors always seemed so dark, long and daunting. I guess anything would look like that at such an early age. Now, still a bit dark, everything looks so small. 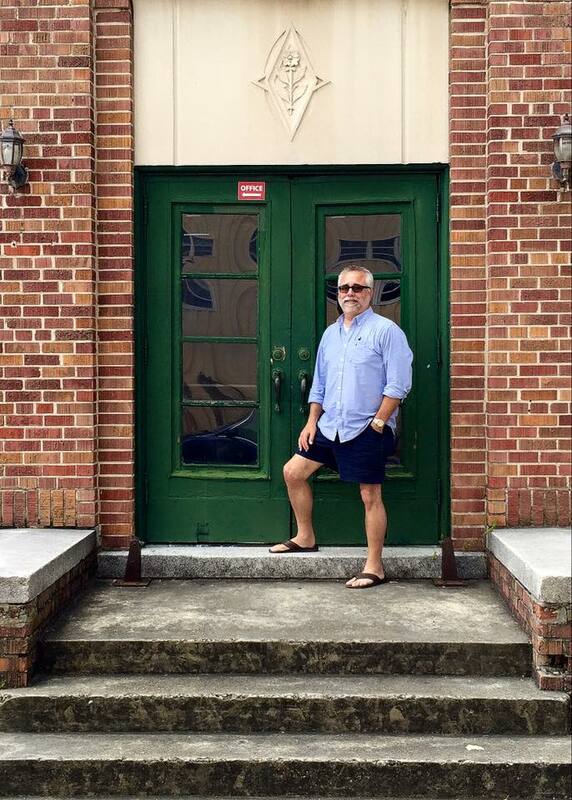 Flash forward to the present and the “not-so-clear-memories.” If not for the photos that my wife took, as well as others, at The Final Bell Has Rung Celebration, I would not have remembered who I ran into. Those who I did manage to see, although I hadn’t seen some of them in 45 years, I still recognized them. They still had the same faces, just a little bit older, sometimes grayer (like me), but I knew exactly who they were. It made me realize that she saw me as I “used to be” and it made me happy that she could see that. On the other hand, it saddens me that I am not that person all the time anymore. I want to be, and sometimes I am, but I want to be that person all the time, if not for any other reason than for her. She married a man who was funny, lively and outgoing and I still am at times, but I’m not as spontaneous as I used to be. It makes me extremely anxious and that pisses me off. Anyways . . . as I said before, if it weren’t for the pics, I would have a hard time remembering a lot of what happened and who I ran into. I can be reminded of something if someone prompts me or brings up a certain situation but unfortunately, I’m not able to remember those things on my own. As long as my long term memory stays intact, I can recall many memories, have many movies play in my head and still recall those dear friends from 40+ years ago. I just can’t remember the present too well. And that my friends is the beginning of a long, horrible road that I know I will travel, but I will travel that road with all my memories of yesteryear and those memories will include those of you whom I have had the pleasure of making your acquaintance. We have memories of you and how you are coping with this horrible disease. Your strength and courage will remain with us for many years to come. Love you.